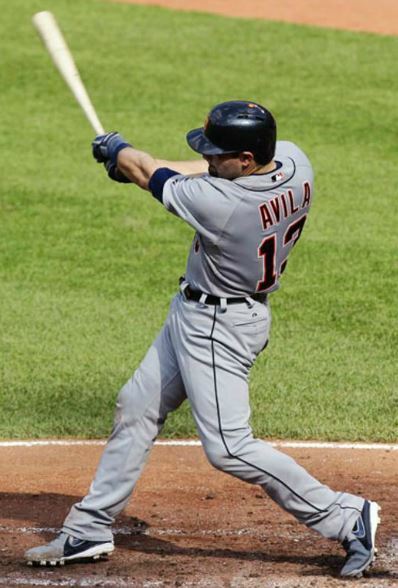 Detroit Tigers catcher Alex Avila is a rising star in Major League Baseball and a committed man of Catholic faith. After just one season in the minor leagues, Avila made his major-league debut in 2009 at age 22. Four years later, he’s already one of the American League’s most accomplished catchers, starting in the 2011 MLB All-Star game and helping Detroit in its run to the 2012 World Series. The 2013 season has been a different story for the now 26-year-old Avila. The son of Tigers’ Vice President, Al Avila, he missed 13 games in June after being hit by a pitch on his left forearmmand another 16 games in August after suffering a concussion on a foul ball off his catcher’s mask. Having missed 58 of the Tigers’ 137 games this season through Sept. 1, a now-healthy Avila is again in position to be both a key player in the Tigers’ chase for a World Series championship and a Catholic example for millions of viewers watching Major League Baseball. Review sports editor Chris Kudialis caught up with Avila to ask about his season thus far, his take on being a role model and how he uses Catholicism to overcome adversity. Do you have any feeling comparable to playing in the World Series? No, not even close. I would say that and the 2011 All-Star game were two of the most memorable moments of my life. You’ve faced a lot of adversity this season, in terms of injuries and all that you’ve had to overcome. How has your faith played a part in your return to the field? My Catholic faith has been one of the biggest things in helping me get through adversity this year, especially the injuries. When I wasn’t able to do what I love to do and be around the family that I have in the Tigers’ clubhouse, it was easy to get lonely. Anybody facing adversity may think that they’re fighting it alone. But that was one thing I was constantly reminding myself of: We’re not alone! Not only do we have family and friends, but, most importantly, we have God. Does God have a role in baseball? He’s there with me, absolutely, but I’m usually focused on what’s going on out there. I pray before every single game and thank him after games for the day and to be able to come out injury-free. Do you share your faith with teammates at all? There are a few guys in our clubhouse that are Christians, and there have definitely been some times when we’ve talked about our faiths and how God has shaped our lives. But, for the most part, it’s a personal thing with most of the players, and each guy lives his faith in a way that makes him closest with God. You mentioned in an interview with the National Catholic Register last year that reconciliation is something you most appreciate about the Catholic Church and something that revives you. What does participation in the sacraments do for you from a strength standpoint? Taking part in the sacraments and praying every day gives me the courage to face adversity on a daily basis. The adversity of a major-league ballplayer is not real adversity faced in everyday life by most people. But … the sacraments give us the strength to face any of life’s struggles, whatever they may be. One of the toughest yet joyful things for me this year was the realization of being a father when my daughter was born in April and realizing that someone’s life is depending on me. It doesn’t matter where you are in life. When you have that realization, it’s scary. And the sacraments are giving me courage to face the new challenges and blessings of fatherhood. As a professional baseball player, do you feel a responsibility to be a role model? I think, for the most part, people in the public eye should feel a responsibility to be role models and live a life that not only they can be proud of, but a life that reflects God and Jesus. That carries through to the people you encounter and the people who watch you. Has your faith changed at all during these last five years as you’ve risen through the Tigers’ farm system to being an MLB All-Star and the club’s starting catcher in the World Series? My family has always been a very strong Catholic family. We go to church every Sunday, and my parents always tried to teach me to pray every day, things like that. I went to Catholic school my entire life growing up. I’ve had times during my life when I doubted myself, and I doubted God. And that’s only human nature. But with the success that I’ve had professionally and personally, my faith has only gotten stronger. As I’ve gotten older, I’ve started to realize how much God has given me. And I want to repay him with my faith and by living a life in reflection of him — a life that he would be proud of. At this point in the season, do you feel like you’re playing playoff baseball yet? Absolutely. For me, the start of August is the start of that grind to getting to the playoffs and doing what you can to accomplish that. Once you get to September, it’s the stretch run. It’s maintaining that level of play, that level of consistency and that type of focus to be able to make it there. Does the grind of these two months take a higher mental and physical toll on players? Yes, and we can tell by the games we played over the past few series. They’re draining games. There’s a special emphasis on each pitch, and games are lasting three to four hours each night. Players and managers are taking their time to make sure they’re making the right decisions. Do you pray more during stretches like these? At this point, these games are pretty intense to the point that I pray that everybody is able to stay healthy. Because this is the time of the year that, as players, you want to be playing, and it’s tough when you’re not able to. You’ve been to the playoffs the past two seasons, and you guys are in great shape to make it again in 2013. Do you feel like this is the best team you’ve played on in the past three years? This is the best team I’ve played on and probably will ever play on in my career. You won’t see teams built like we are — you just don’t see it. With all of the talent, the All-Stars, the potential Hall-of-Famers — a team like this doesn’t happen too often.